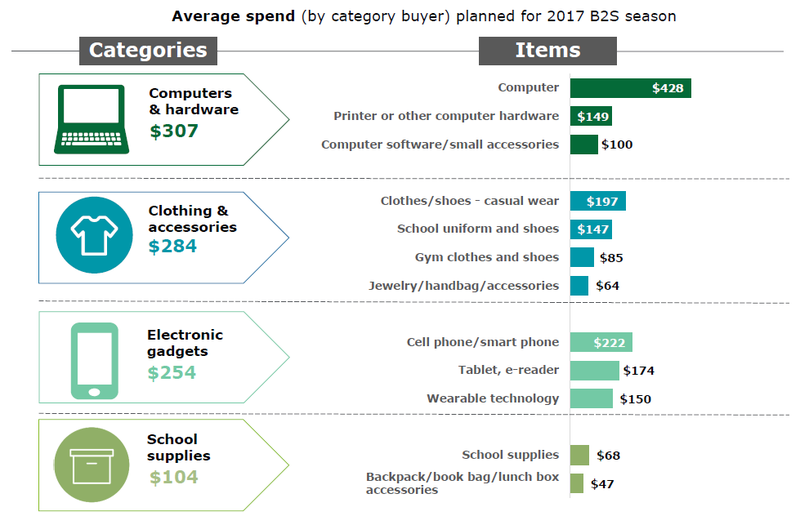 In 2017, parents expect to spend an average $501 per student on back-to-school items, making this an estimated $27 billion market, Deloitte said. 55 percent of parents' dollars are expected to go toward clothing, up 10 percent from last year. School supplies will consume 20 percent of dollars; computers and hardware will take 14 percent of spending; and electronic gadgets will account for 9 percent, the Deloitte survey found. Back-to-school signs are displayed in a Target store in Chicago, Illinois. Retailers that are choosing to wait until later in the summer to roll out their back-to-school deals could be missing out on a greater portion of the summer sales, according to a new survey from consulting firm Deloitte. Sixty percent of U.S. shoppers visiting stores prior to August for back-to-school items will spend an average of $532, which is 16 percent higher than the rest of parents who don't start their shopping until August or later, Deloitte found. Those later shoppers will likely only spend about $458 per pupil. 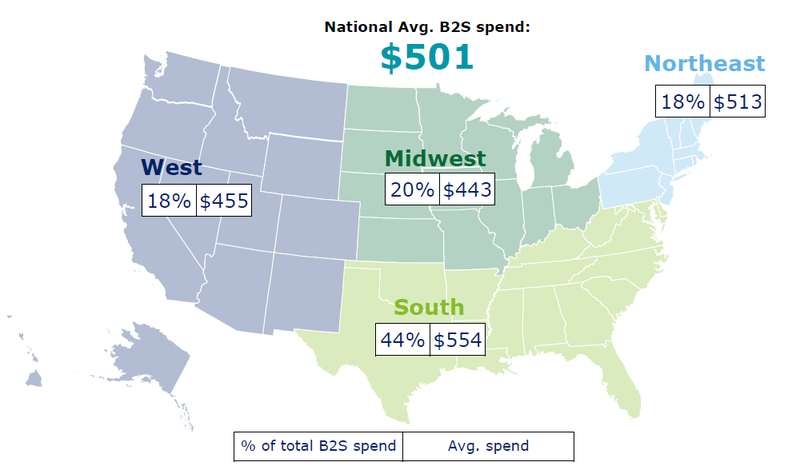 "As a result of different school start dates across the country, shopping trends also vary greatly by regional location with the highest average spent $554 (44 percent) in the South region this back-to-school season," the report said. Taking this into consideration, retailers should be curating their back-to-school strategies based on geographies and taking timing into account, Rod Sides, vice chairman of Deloitte's retail practice, told CNBC. "The big thing for these guys is to get the timing of promotions right," Sides said. "It's already mid-July, and I have yet to see a real back-to-school push, but [retailers] ought to get those out there." A lot of folks might be "second guessing" back-to-school season this year, he added. But there is undoubtedly a "high percentage of shoppers," with school-age children and college students, up for grabs this summer, Sides said. This year, parents expect to spend an average $501 per student on back-to-school items, making this an estimated $27 billion market. In 2016, parents anticipated spending an average of $488 per child — slightly less than this year's figure and with more dollars going toward basic school supplies and computers and hardware, Deloitte found. This year, 55 percent of parents' dollars are expected to go toward clothing, a big-ticket item, up 10 percent from last year. School supplies, meanwhile, will consume 20 percent of dollars, computers and hardware will take 14 percent of spending, and electronic gadgets will account for 9 percent of the total spent, Deloitte said. Another key finding in Deloitte's back-to-school survey: There's a shift happening in where parents are ringing up purchases. And much of this "confirms" the headlines in the news about struggling malls, Sides told CNBC. The majority of Deloitte's survey respondents, or 81 percent, plan to shop at mass merchants, such as Target or Wal-Mart, this year, representing a 24 percent increase from 2016. Off-price chains, such as Ross and TJ Maxx, are also gaining in popularity, climbing to 28 percent from 10 percent year over year. According to a similar report from Branding Brand, the majority of shoppers will choose to pick up items for school at Target, Wal-Mart and Amazon this back-to-school season. The biggest loser among retailers this year looks to be department store chains. Those parents saying they'll shop at department stores — think Macy's, J.C. Penney, Sears and Kohl's — for school items is 28 percent, down significantly from 54 percent last year, Deloitte found in its research. Only 8 percent of parents plan to visit specialty clothing stores this summer and fall, dropping from 25 percent one year ago. This year, stores — be it for dresses, pens and pencils, or tablets — should really plan to go after the "undecided" consumers, Sides said. "They collectively represent nearly $5.4 billion this back-to-school shopping season," Sides said in a statement about so-called undecided shoppers, who might not know where they're going to buy something until the last minute. "This segment is up for grabs but likely to go to retailers that draw customers in early with promotions and digital experiences that make store visits even more attractive, like inventory visibility, order tracking or buy online/pick up in store." This survey was conducted online by Deloitte between May 31 and June 6, polling a sample of 1,200 parents with at least one child attending school in grades K through 12 this fall.